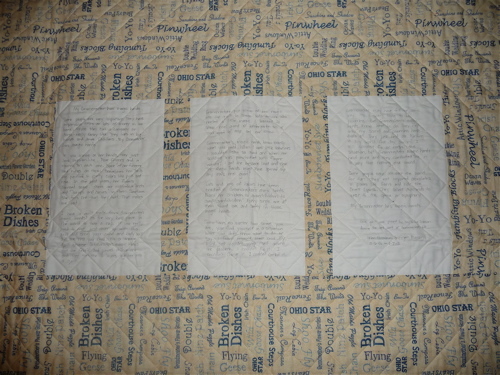 that i had neglected to fill you in on the history of the gramcracker square quilt. sigh. i’m so behind. pretty simple deal really. gramcracker spent some time in the hospital and a rehab facility during the last 6 weeks of her life. As a family, we spent the majority of those round the clock 60,480 minutes with her. We read stories and magazines and the Bible. We shared memories and confidences and pictures. We held hands and cried tears. and sometimes we even argued with each other a bit. 🙂 A family of lily livered unopinionated people we are NOT! 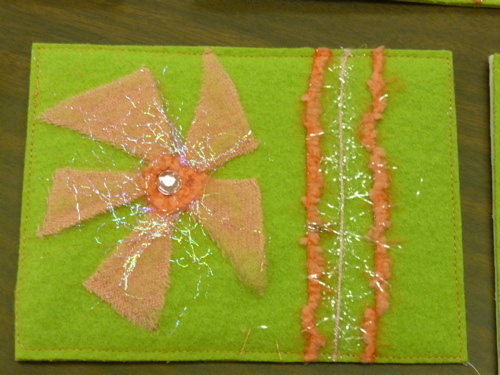 When I would stay with Gramcracker overnight, i toted my portable sewing table and sewing machine with me. and gram and I would talk fabric and stitches and quilts. when she would sleep for a few minutes, i would sew using just the light on my machine and the light that drifted into her room from the hallway. My pattern was very random and my corners do not all match up. and i’m good with that. My Gramcracker has magic hands. Some people are very important. They have impressive titles or lots of money in the bank. Maybe they run a company or dress really fancy like. They live in big houses and drive Cadillacs. 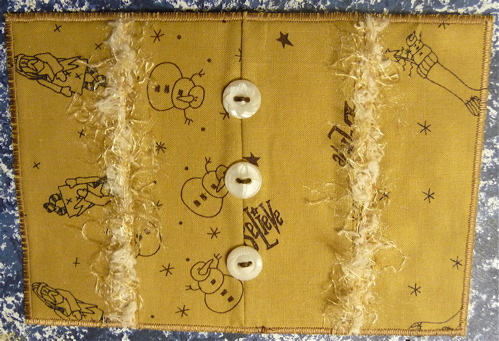 My Gramcracker has magic hands. If you glance at her hands, they just look regular-like. Four fingers and a thumb on each one. Some of her fingers have rings on them. Sometimes her nails are painted in real pretty colors like pink and rose. In the past years, her fingers changed some. There are noticeable “knots” and “bumps and curves” in them. Sometimes she tells me that they hurt. That makes me sad. 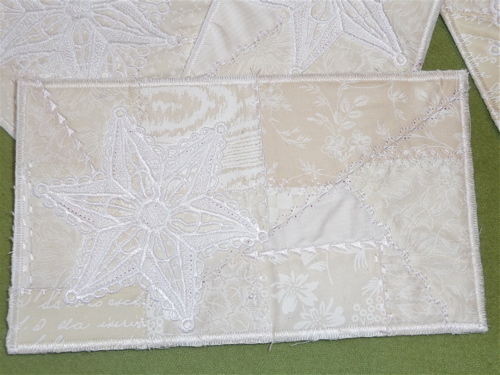 I have a quilt made from Gramcracker’s magic hands. It’s the very best place in the world to take a nap. If you really need to rest, just cover up with this quilt and soon your mind and body will get the rest you need. It’s a magic quilt because Gramcracker’s magic hands cut the fabric and pieced it together and then tied the 3 layers together into a quilt. 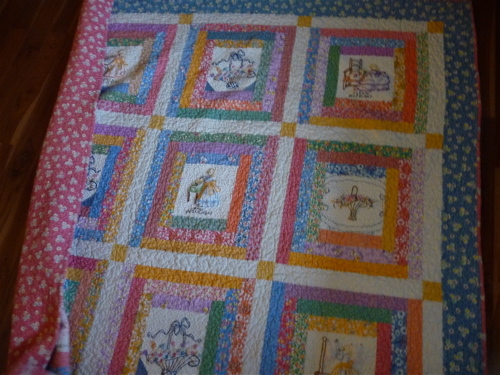 Gramcracker put some of her magic into the quilt to share with anyone who needs a little magic. I learned to share real good in kindergarten so if you need to rest, let me know. Gramcracker’s magic hands know exactly what you need. When I was little, sometimes I wouldn’t listen so good and when her scolding was punctuated with finger waving, I got the message loud and clear. The magic hands must have opened up my ears real good! Lots and lots of babies have been cradled in Gramcracker’s magic hands. From her children to grandchildren to great-grandchildren! Every single one of them found love and safety in those magic hands. Sometimes no matter how smart you are, you find yourself in a situation where you don’t know what to do or say. I found myself there once. My mind just couldn’t wrap itself around the problem. I couldn’t fix it. I couldn’t change it. I couldn’t control it. Gramcracker may have felt the same way. It’s a scary thing to be powerless. But Gramcracker’s magic hands knew what to do. They held onto my scared and powerless hands. That’s all. They just held me. Nothing in the world that day changed. I still couldn’t fix or control the situation, but Gramcracker’s magic hands held mine and they comforted me in a way that nothing else could. Some people travel all over the world for fun. They eat imported chocolates in places like Paris and ride the Orient Express. They collect diamonds to wear to the opera or symphony. My Gramcracker has magic hands. it’s almost march 31 and i don’t have my postcards completed. i got a late start and i’ve been struggling with them. the postcards are not intricate or difficult. it’s me. i need to rewind back several months-even years. sylvia is my friend. i met her some twenty plus years ago in a work environment. we took some college courses together. she is so mental. by that i mean she thinks ALL the time. even when it looks like she’s loafing, her wheels, they are a turning. we shared a love of reading and often discussed and shared books. for a short time, we even belonged to a classic book club. fast forward 10 years and our lives took different paths. i moved out of the area. she married. i stopped working in corporate america. she divorced. she moved. we’d lost touch with each other for the past few years. about a year ago, she kept popping into my head. i’d wonder where she was and what she was doing. what books was she reading? who was in her life? was she happy? over a period of months, i looked in the phone book for her. no sylvia. i remembered she had family in another city, so i looked for her there. no sylvia. i googled her. i switchboarded her. i facebooked her. nothing. nada. then one day last fall i thought to facebook her son. and found him. i messaged him and it took several weeks but he put me in touch with his mom. sylvia was very sick. and she wasn’t going to get better. there was little i could do. even visiting her was challenging because many times she wasn’t up to it and the times it did work, after a very short time, she was worn out. we ran out of time. 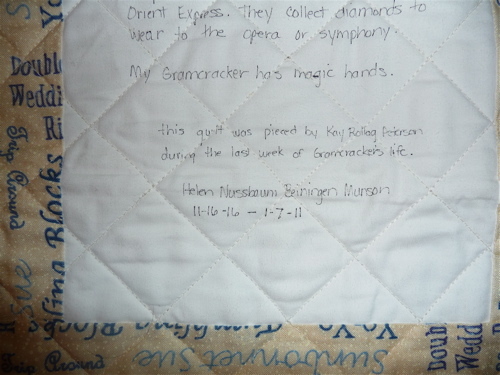 my friend sylvia died on february 27, 2010.
i gave her a quilt. not one that i had newly finished. i gave her one of my favorites. one that i’d loved for years. 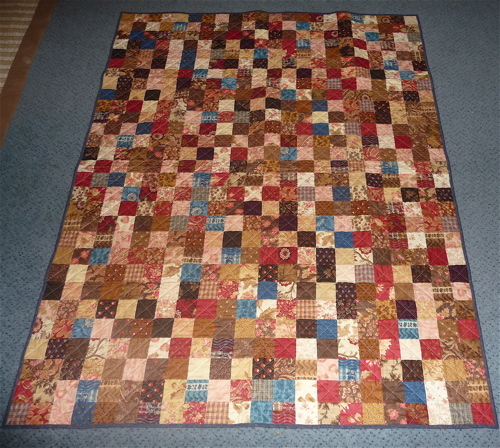 one of the first quilts i ever longarmed. one of the first lines of fabrics that we purchased when we had the quilt shop. 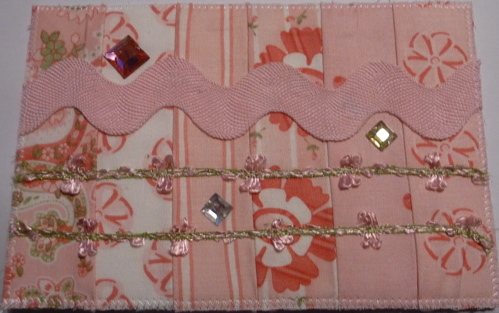 i had decided to send her a fabric postcard each month to let her know i was thinking of her. i can’t even put into words how precious little it feels like i was able to do for her. march’s postcard is titled “sylvia”. 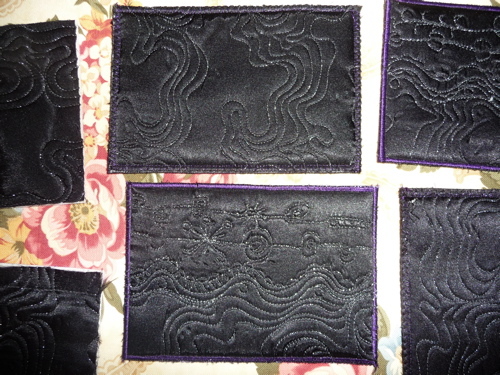 i’m still working on them. i wish i had more time. dear kay. when will you ever learn? dang. i really really hate this when it happens. i want to pretend it never happened. i wanna act nonchalant and say “nope. i don’t know what you’re talking about.” and ” i’m sorry i can’t recall” even “you must have me confused with someone else (like someone stupid and rude)” i know better. i should do better. but i don’t. of course i wouldn’t have to drag all of you into it but then, what fun would that be? so i took the truck in for some service work. just minor stuff, oil change, rotate, recall thing and a little hic up we’ve been having with the display that tells you the direction you’re heading, the temp and the miles etc. since i like to be informative, i tracked the series of events leading up to the hic up several times……depress brake pedal, followed by a “click” in the rear door panel (possibly engaging the “locks”) then the display starts flashing, ending with no display. the mr. rolled his eyes into the back of his head when i informed him of my deductions. hmmmm curious says my service man. we’ll check it out and call you in a couple. i love my service man. turns out the little hic up was a bigger deal but it’s covered under warranty so we’re all good. it’s fixed up and i’m on the road. next day the mr. drives the truck and calls me to inquire if i noticed the number of miles it is displaying. i’m all “huh”? and he says the truck went in with 49,000 miles and came out with 66,000. and i shoot back a “yeah right. pull my other finger”. he then throws it in my face (alright he just mentioned) about “remember that conversation….” blah blah blah. me: no i don’t remember. because it probably revolved around the number of miles on the truck. and i probably won’t remember this one either because IT’S BORING! who cares? you drive where you need to go. how ever many miles it takes you to get there. and once you’re there, guess what? you have to drive back. it’s miles. it’s a dang number. relax. look out the window. enjoy the sunshine or some moonshine. don’t spend your life tracking a spinning number. naturally i followed this up with a “you’re completely crazy” tangent. i may have over-reacted. a titch. things were relatively cool that night. okay fine, i slept on the couch because he was mad so i got mad because he had no stinking right to be mad. it’s not like he doesn’t call me crazy every day. ok, he doesn’t but he’s thinking it. i can tell this things. really it was just an excuse to be totally ridiculous and sleep on the couch which i LOVE ( remember angelina lips? ) and have been missing since scott’s been home lately. this was january 15. 2 months ago. even i don’t think i could possibly put on 19,000 miles in 2 months. i call my guy. no, not the mr. i call my service guy. human error that will be promptly rectified. that was the easy part. now loads of people think it’s real important to make public apologies so i’m here to say: scott was right. i was wrong. the fact that he doesn’t read my blog should not enter into the equation. i can’t be responsible for everything.